Sony’s innovative I-Array™ tweeter system achieves the wide dispersion and ambience of original recordings and movie dialogue without adding any unnatural artifacts to the sound. The result is smooth highs with increased resolution, broader soundstage and a delicate but precise sound image. Flexible zone distribution capability allows a Z-Series receiver to distribute audio/video sources (HDMI and analog) to the 1st and 2nd zones in varying configurations providing expanded options. Optimum gain volume (ver. 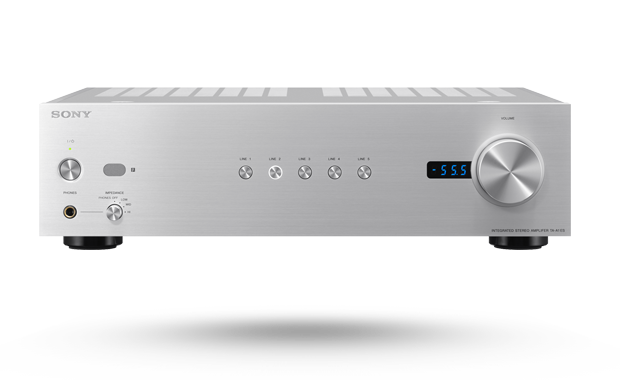 2) combines electronic volume with a discrete buffer amp co-developed by Sony. It boasts massively reduced gain error and sound quality superior to conventional volume controls. In developing this amplifier, we focused on achieving a structure that enables high output even with a single PP circuit. Generally, large-output amps employ a power amp stage with multiple transistors to achieve high current output volume, but transistors do not perform identically and emitter resistance is used to stabilize transistor variations. In this amp, however, the power amp stage features only one pair of transistors and a design that eliminates variations in each channel at the source, enabling elimination of variation-controlling emitter resistance as well. With this design, transistors drive the speakers directly, which contributes to more character-free sound quality. Based on sound quality considerations, a large, Sony proprietary, toroidal transformer was integrated, featuring a 300VA rating-the highest in its class, in addition to a rated capacitance of 24000μF per channel.